The former owner of one of Russian banks Alexander Konanykhin and his wife Elena Gracheva who lived in the USA, were arrested during the attempt to cross the border between the USA and Canada. 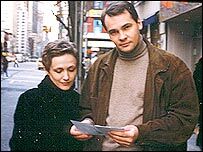 In 1999 this couple received political asylum in USA, on November 22, 2003 the Immigration and Naturalization Service (INS) deprived Konanykhin of this status. According to the decision of the US Appeal Commission on Immigration Cases, Konanykhin along with his wife were requested to leave the USA voluntarily within 30 days. In case of failure to follow this request the businessman would undergo deporting the USA. After learning about terminating their status Russians they sent an appeal. However, they did not hope much for decision in their favor and decided to move to Canada, but were detained before crossing the border. Russian authorities are accusing 37-year-old Konanikhin of stealing more than 8 million dollars. At the beginning of the 90s he was one of the founders and the President of the All-Russia Exchange Bank. Several years later this bank went bankrupt. Currently Konanykhin is the Head of KMGI Internet company located in New York. The Russian businessman was arrested on the Friendship Bridge and in taken into the Russian Embassy in handcuffs. According to BBC, Konanykhin and his wife Elena Gracheva were arrested on the Friendship Bridge three weeks ago. However, he has informed about this from prison in Alexandria just now. His wife has been released on bail and is staying with her friends in Washington. According to Konanykhin and his wife, after learning that they have the prospect of being deported to Russia, they decided to do something. They made inquiries in Canada and were informed that their application for political asylum is likely to be satisfied. On December 18 they approached the Friendship Bridge on the border where two employees of Canadian Immigration Department were already waiting for them on the Canadian side. But when they were standing in the line to pay the cheap border fee, 12 persons wearing masks and having machine-guns surrounded their vehicle. Konanykhin and Gracheva were handcuffed and taken to the airport of the city of Buffalo, from where they were taken to Washington, DC by passenger flight and then to the Embassy of the Russian Federation. According to spouses, them were supposed to be boarded the plane and sent to Moscow the same evening, but as they have understood the Consul General did not have all the papers necessary for this, and therefore their return to their Motherland where they had not been for 11 years, was postponed. Irritated American law-enforcers took them to prison, but did not quit the intentions to send them to Moscow. The next morning Konanykhin and his wife were hastily brought by plane to New York Kennedy airport and put in handcuffs in the line for the Moscow flight of Delta was due at 5:30 pm. However, the previous evening the prisoner was at last allowed to contact the lawyer who called the judge who was hearing the case of the dispute between Konanykhin and the US Immigration Service in mid-90s, BBC informs. The judge hastily arranged legal hearing and during it under the threat of punishment ordered the representative of the Federal Office of Attorney General to phone hiss office and cancel sending йНnanykhin and his wife to Moscow. They were taken back to prison near Washington, and five days later Gracheva was released on bail. The judge repeatedly expressed suspicions concerning the authorities' ground for arresting Konanykhin by asking if it made sense to prevent йНnanykhin and his wife from doing what the Immigration Service wanted from them - leaving the country. "Maybe the US government would prefer them to go to Russia, not just to leave the USA? ", questioned the judge putting forward the allegations that some deal with Moscow took place. According to the judge, he still remembers the reasons Konanykhin put forward in the 90s saying that the US Immigration Service tries to deport him as a gift to Russians for opening the FBI office in Moscow. At that time Konanykhin was able to convince the court which granted him political asylum. The Attorney General Office denied the allegations of the deal with Moscow and said that Konanykhin was arrested for not informing the authorities about his last change of a residence. Answering the question why Konanykhin's wife was taken with him, the Attorney General Office informed that it did not want to separate spouses. The next hearing of the case is scheduled for January 14. While in prison, Konanykhin waits for the hearing and also tries to supervise his Internet company. The decision of the US authorities could be connected with the case of Khodorkovsky. Alexander Konanyhin also assumes that the decision on his deportation could be connected with the case of imprisoned in Russia former YUKOS company Head Mikhail Khodorkovsky. In 1998, when investigating the disappearance of deposits of the European Incorporated Bank, the UN Bureau on Controlling Drugs and Fighting Crime came to the conclusion that this financial institution was "apparently founded by the two Russians -Alexander Konanykhin and Mikhail Khdorkovsky". "This may be just a coincidence, after all, I was vice-president on international development in Khodorkovsky's company in 1993-95", Alexander Konanykhin said. "I am shocked by the Immigration Service statement that there is no prosecution on political reasons in Russia", Konanykhind said to reporters. "This sounds especially ironical today when the whole world speaks about the new period of prosecuting on political reasons the businessmen who dared to express their opinion". "This period was opened with my case and now is ending up with the case of my good friend and former partner Khodorkovsky. These are the parts of one process", йНnanykhin said. As for his possible return to Russia, the businessman says "it means death to him". International warrant on search and detention of former bank owner Alexander Konanyhin and his wife Elena Gracheva is still valid, Russian Interior Ministry informed Interfax news agency on January 9. According to the Ministry, both of them are suspected of stealing big sums of money, and this crime has no expiration time". The Russian Bureau of the Interpol has prepared all the documents necessary for detaining Konanykhin. The Russian Interpol Bureau has prepared all the documents necessary for detaining former banker Alexander Konanyhin, Bureau Interim Chief Sergey Pismensky said in an interview to RIA Novosti Information agency. "йНnanykhin has been on international search since 1996. Every year this search is confirmed by the Russian Office of Public Prosecutor. The USA and Canada have been notified about this by the Interpol", Pismensky said. Besides, the Interpol has sent the relevant documents to the Russian Foreign Ministry. According to Pismensky, the Russian Interpol Bureau sent the inquiry about Konanykhin to the authorities of the USA and Canada. He said that "in future inquiries we will be to learn if Konanykhin is going to be deported home". In the beginning of the 90s Konanykhin was one of the most powerful businessmen in Russia. Alexander Konanykhin, born in 1965, at one point was no one of the richest businessmen in Russia. After arriving from Riga in 1983, he entered the Moscow Physics and Technical Institute, but was excluded from it in 1986. In the beginning of the 90s Konanykhin became a successful businessman. In 1991 he already supervised the All-Russia Exchange Bank. According to one of versions, he bought the first in Russia Mercedes 600, supervised a significant part of the Russian currency exchange market, financed Boris Yeltsin's election campaign. According to some sources, his capital totaled 300 million dollars. According to another version, the former KGB officers being close to the new authorities, established the All-Russia Exchange Bank for money laundering, and Konanykhin just served their interests. In 1992 the Public Prosecutor Office accused the banker of stealing 8 million dollars from his own bank, and he escaped to the USA. In 1993 Konanykhin established the European Union Bank in Нff-shore state of Antigua. According to Konanykhin, he founded this bank in partnership with Mikhail Khodorkovsky. The European Union Bank was the affiliated company for MENATEP where Khodorkovsky was the president, and Konanykhin supervised the bank while being the vice-president of MENATEP. In 1996 the financial legislation of Antigua was made strict, and the next year the bank disappeared along with its assets. In 1996 Konanykhin was in American prison for almost a year because of the expired visa. During the investigation the FBI found out that the visa was expired, and Konanykhin may not be deported to Russia where he can be prosecuted on political reasons. In 1997 the former bankers was set free on and have the state paid for the guards protecting him. In 1999 he was granted political asylum and the INS was ordered to pay him 100 thousand dollar compensation. However, the INS appealed against the court verdict and deprived Konanykhin of the refugee status. Konanykhin denies the accusations of stealing $8 million - it is too little sum for him. "I was the most well-known and prosperous banker. I had well-organized business which could not fail because I am an analyst. No cataclysm could shake my bank. What reasons could I have to steal money? To become a fugitive in the homeland for the sake of 8 or 100 million dollars? I had much more", he said in 1997 in an interview to Profil magazine. Konanykhin states that he personally knew President Boris Yeltsin, and in 1990-1991 his bank sponsored Yeltsin's presidential campaign. "I entered the Kremlin on my ZIL vehicle whenever I wanted and was welcomed in any office. If Yeltsin was in, he never refused to speak to me. Contrary to the other "Kremlin's friends", I never waited for being received for more than one hour ", he says. The businessman did not try to hide the size of his wealth. He said he used to have the biggest house in Moscow suburbs with a swimming-pool, a winter garden and garage accommodating 12 vehicles. The house construction took several years. "I managed to sell it by photo at one million dollars", Konanykhin said. "In Russia I left my magnificent 5-room apartment on Berezhkovskay Embankment. For any service conducted by my bank, for example, exchanging money, I had 20 percent of net profit. The All-Russia Exchange bank was the first to start serving private individuals". "I conducted the first currency auctions", he said. "The interest for converting was 15-20 percent. Within the first three months the bank turnover exceeded the annual turnover of the currency stock exchange of the Central Bank. I remember how the Communists demanded in Parliament to stop Konanykhin. They did not like that the private institution gained has such power. I was able to establish the rouble exchange rate. The All-Russia Exchange Bank conducted about 50 percent of all currency transactions and was the first to start transferring money of juridical persons and private individuals abroad". According to Konanykhin, he had "huge personal savings. Therefore stealing 8 million dollars would be ridiculous". Konanykhin said that in the USA he had purchased the apartment in Watergate at 315 thousand dollars, and the monthly payment for this apartment is 2.5 thousand dollars (the data for 1997). "I have stepped over that boundary when the person is interested in money as such. I am excited with the process of its earning. If I were preoccupied with the issue of just having a comfortable life, I would be able to live happily anywhere and never work", he says. Meanwhile, Konanykhin is not going to apply for the US citizenship. "I don't even need the residence permit it will require me to pay taxes, according to the US law, for all incomes wherever I earned them. I want to spend in the USA some more years. Yet, this is a good country for business", Konanykhin said.